Kraft Australia executives and staff choose to volunteer as a way of celebrating a milestone donation of one million kilogorams of food to Foodbank Australia. Kraft Australia executives and staff have celebrated a milestone donation of a million kilograms of food to Foodbank Australia without a party – instead choosing to volunteer their time to VicRelief Foodbank this week. 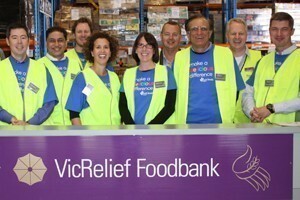 VicRelief Foodbank is Foodbank Australia’s state member organisation and helps feed an estimated 400,000 Victorians unable to afford to buy food each year. The President of Kraft Foods Australia & New Zealand, Rebecca Dee-Bradbury joined a team of 20 Kraft volunteers, including Executive Vice-President of Kraft worldwide and President of Kraft Asia Pacific, not only to celebrate their milestone donation, but also as part of their annual global giving week, which will see over 14,000 employees volunteer across the globe. Dee-Bradbury says her choice to volunteer at Foodbank Australia was a reflection of the importance Kraft placed upon its partnership with the food relief organisation. Front row – from left: Senior Vice President, Kraft Foods Chocolate Global (Northfield – USA) Timothy Cofer, Kraft Foods President Asia Pacific Pradeep Pant, Kraft Foods Director Corporate Affairs Australia & New Zealand Simon Talbot, Kraft Foods Director of Marketing, Chief Category & Marketing Officer (USA) Mary Beth West, Kraft Foods President Australia & New Zealand Rebecca Dee Bradbury, Foodbank Australia CEO John Webster, Kraft Foods Executive Vice President & President Developing Markets (Northfield – USA) Sanjay Khosla, VicRelief Foodbank CEO Ric Benjamin, and Kraft Foods Vice President Marketing Asia Pacific, Shawn Warren. She says volunteering and understanding their community partners is immensely beneficial to the Kraft Foods team as it increases employee engagement, enables staff development and ultimately makes us a more sustainable company. The CEO of Foodbank Australia, John Webster, says the organisation was exceedingly grateful for Kraft’s multifaceted support. He says the partnership has evolved well beyond the generous food donations they make to the organisation nationally, which has totalled 1 million kilograms of food in the past four years. The donations include the iconic Australian staple, Vegemite and pasta products such as Mac and Cheese, cheese slices, aka “singles”, cheese strings, assorted jams and peanut butter. VicRelief Food bank says Kraft provides food that is great for people with limited kitchen facilities as well as nutritious, wholesome foods for people living in hardship. John Webster says Kraft also provide hundreds of hours of volunteer support each year as their charity of choice. Kraft's Dee-Bradbury and the other Kraft VIPs joined other volunteers to package food relief hampers, including food donated by Woolworths, and assisted some of the 480 plus community organisations who rely upon VicRelief Foodbank to provide food and material aid for their clients.